Extract from Healthy Home Healthy Family (2nd edition) by Nicole Bijlsma. Due in September 2012. The cosmetic industry is largely self-regulated which can mean little or no regulation. Put simply manufacturers can put (almost) whatever ingredients they want into their products. Many of the ingredients are skin, eye and lung irritants, as well as known carcinogens and reproductive toxins in ‘acceptable’ levels. If you have eight minutes to spare, I strongly suggest that you watch the Story of Cosmetics and you will know what I mean. In addition, the shift towards online shopping of overseas products has meant that the regulatory systems in place to protect the consumers are now by-passed. Lead is not generally added as an ingredient to lipstick, rather it may be found naturally in the pigments. Consequently it was found in most of the 400 brands tested including those marketed as ‘natural’ (US FDA, 2012). Are the authorities paying lip service to contaminants in our makeup? In 2007, a survey of 33 lipsticks discovered that 20 had lead within them (Campaign for Safe Cosmetics, 2012). This was followed up by a recent investigation of 400 lipsticks which confirmed lead in most of them, with some containing levels up to 7.19 ppm (US FDA, 2012a). 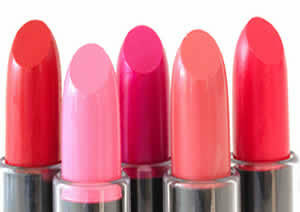 The manufacturers do not add the heavy metal lead to lipsticks, rather it may be found naturally in the pigments used. As there is no limit to the amount of lead allowed in lipsticks, you essentially have no idea how much you could be exposed to. There is no safe level for lead. Lead causes learning and behaviourhal disorders such as hyperactivity, reduced IQ, sleep disturbances and increased aggression in children. It is particularly toxic to pregnant woman as it crosses the placenta where it may affect foetal brain development. Assume all tinted lipsticks contain lead unless the manufacturer can provide a Certificate of Analysis from a NATA accredited laboratory stating otherwise. Pregnant women and children should avoid tinted lipstick altogether. Lip balms made from vegetable oils such as Hemp oil, Jojoba, Avocado, Natural beeswax and Rosehip oil and Shea butter are a healthier option. Natural makeup brands worth investigating are Miessence, Organic Rosehip Skincare, Living Nature, Phyts, Ere Perez, Jane Iredale and Dr Hauschka. Click here for other hazards in makeup.